The clearing of the 10-acre secondary growths at Mile 61/2 Penrissen Road. We chart our course, but let’s see the world through the eyes of a child and be mindful of their future in every plan we make now. SEVENTEEN hours! Two flights with three hours at KLIA, absorbing almost 500 MB data and digitised maps, I was physically exhausted and mentally in a state of faintness. I could feel the force returning when I stepped back onto Sarawakian soil. The verve was slowly fixing itself as I focused myself from the streets of London back to the peaceful and quiet Kuching midnight traffic. But turning into the side road leading to my house gave me a strange feeling. Something was amiss and for a moment, I thought I had missed a turning. But the familiar neighbourhood houses were reassuring. Early next morning, the dim light of dawn alerted me to a huge clearing of the secondary growth that had separated the housing garden from centuries old burial grounds of two Chinese clans. I blamed my sunny boy for not watching over the hundreds of trees when I was away. But, as an adult, our faith shatters very often with almost every patch of greens in and around Kuching being bulldozed, making way for riotous and uncontrollable “development”. Nothing sentimental about these “green lungs” for their beauty, or potentials as jogging and cycling parks little sunny boys and girls in Kuching are wishing for, but the very fundamentals of these small secondary growths which are buffer zones to cushion the destructive impacts of flooding! I am worried. Yes, “Blessed are the pure in heart, for they shall see God.” But these pure in heart boys and girls, who are completely trusting and guileless, are to grow up to suffer the wrath of our indiscriminate destruction of our natural surroundings. In the aftermath of a devastating flooding of the East Coast states in the peninsula, the government was shocked and it appeared they are serious about addressing the issues to prevent future disasters. Early in the month, Prime Minister Datuk Seri Najib Tun Razak had announced that a standard operating procedure (SOP) to tackle major floods would be drawn up and tabled in the cabinet meeting within six months as a guideline for everyone in facing such disaster. A senior MP from Kuching, Deputy Home Affairs Minister Dato Sri Wan Junaidi Tuanku Jaafar had immediately echoed that. He said the Public Works Department (JKR) and environment ministries should – in addition to the strengthening of standard operating procedure (SOP) for flood – study estate and township development, environmental impact assessment (EIA) and flood mitigation. Deputy Federal Minister of Environment Datuk Seri Dr James Dawos Mamit was openly critical of the Natural Resources and Environment Board (NREB). He lamented and chided the NREB for being slack in conducting environmental impact assessment (EIA) studies, resulting in flash floods in Kuching District during almost every downpour. He blamed the unmanaged housing development for messing up the existing waterways, so much so that rainwater could no longer flow out normally. “Of course, when the drainage and outlets become narrow as a result of building construction, rainwater is bound to spread over to lower grounds,” he noted. The usual finger-pointing after such devastation, but are lessons learnt? And how serious are we, or the government, about implementing what they thought are necessary corrective measures? 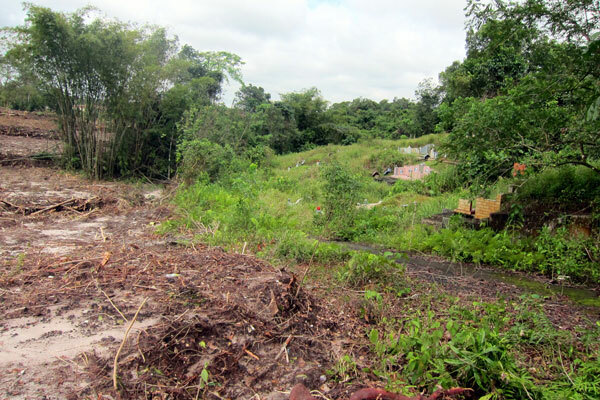 But the clearing of the 10-acre secondary growths at Mile 61/2 Penrissen Road is an affront to what the PM and his cabinet members have preached and pleaded. And just who did this blatant clearing? I was upset and I conducted the land search at the Kuching Land Registry. My worst fear was confirmed. The search, conducted on Friday reveals the registered proprietor of this Lot 1798 is “The State”. The clearing, which completely removed all the trees and grasses of this slope of lush greenery, has pushed the earth to fill the waterway at the bottom of the valley and right next to the “homes of the saints” as sunny boy has thought. But I am certain this is not the government planning for a jogging or cycling park. A managed buffer green zone to mitigate floods is created in all other cities around the world. I might sound cynical but my cynicism has been proven and validated. Every patch of sizeable greens in and around Kuching is being given away to privileged groups and individuals by the authorities for construction projects. Indeed, nothing stops human greed. Without this buffer zone, not only the centuries’ old “homes of the saints” (I saw one dated 1910) are immediately threatened by floods, the Semaba and old residential estates at Penrissen Road are challenged in the very near future. While the new Chief Minister has been seen working hard to combat deforestation, such indiscriminate destructions are actually carried out right under his nose. And it is actually his own Ministry of Resources Management and Environment that is responsible for issuing land leases and keeping watch over the use of land resources. How did this happen? Will the Land Office look into this? Will the state government tell us what public purpose this 10-acre land is for? Will the authorities show us they are really serious about mitigating floods which are threatening our beautiful Kuching City? Can we be more serious with what we preach?